HONG KONG, May 10, 2017 - (ACN Newswire) - More than 225,000 buyers attended seven fairs organised by the Hong Kong Trade Development Council (HKTDC) in April, reflecting a slight increase in attendance over the previous year. Chinese mainland and overseas buyers accounted for about 58 per cent of the attendance with nearly 130,000 buyers. In addition to further strengthening Hong Kong as a trading hub and facilitating Hong Kong companies to secure orders, the fairs made an enormous contribution to Hong Kong's economy, including the tourism industry. The seven April fairs were: the Hong Kong International Lighting Fair (Spring Edition), Hong Kong Electronics Fair (Spring Edition), International ICT Expo, Hong Kong Houseware Fair, Hong Kong International Home Textiles and Furnishings Fair, Hong Kong Gifts & Premium Fair, and the Hong Kong International Printing & Packaging Fair, which was jointly organised by the HKTDC and CIEC Exhibition Company (HK) Ltd. The April fairs welcomed buyers from 165 countries and regions. Buyers from the Chinese mainland rose nine per cent, while those from Japan surged nearly 15 per cent. Attendance from a number of Belt and Road countries also recorded satisfactory growth, including ASEAN countries Vietnam, Cambodia and the Philippines, Israel from the Middle East and Russia and the Czech Republic from Eastern Europe. HKTDC Deputy Executive Director Benjamin Chau said, "From the buyers' profiles, we can see that many companies from Belt and Road countries have already established close trade ties with Hong Kong. They view Hong Kong as a springboard to connect to the world. This proves that Hong Kong has a unique role to play in promoting the Belt and Road Initiative." The visiting Chinese mainland and overseas buyers and exhibitors also boosted demand for hotel, catering and other tourism-related services. According to the Hong Kong Tourism Board, per capita spending of overnight MICE visitors amounted to HK$7,700. Based on this figure, the visiting buyers and exhibitors would have generated HK$1.14 billion in business travel income during the fairs, making the trade exhibitions an important pillar of the tourism industry. The HKTDC commissioned an independent research agency to conduct on-site surveys during the Lighting Fair, Electronics Fair, Houseware Fair and Gifts Fair, interviewing more than 2,700 exhibitors and buyers to gauge their views on market prospects and industry trends. More than half (51%) of the respondents expect overall sales to remain steady this year and 40 per cent of respondents expect sales to grow. Both findings are significantly higher than that of the previous year, an indication of improving market outlook. However, cost pressures remain an industry concern. Survey respondents expect price fluctuations of raw materials (39%) and increases in operating costs (38%) to be major business challenges for the year. Thirty-three per cent of respondents were concerned about global economic fluctuations. Forty-nine per cent of respondents foresee production or sourcing costs to increase, yet only 29 per cent expect FOB (Free On Board) or retail prices to rise, reflecting industry concerns about the difficulty of transferring increased costs on to consumers. Survey respondents were generally positive about the outlook of traditional markets. They were most optimistic about North America, with 58 per cent expecting prospects to be promising or very promising, followed by Western Europe (53%) and Hong Kong (51%). Views were more divided when it came to the emerging markets. Sixty-two per cent of respondents expect the Chinese mainland market to be promising or very promising this year; a finding that is much higher than that of other emerging markets. In terms of product trends, the lighting industry considers lighting accessories, parts and components to be the most promising product category, followed by LED and green lighting and household lighting. The electronics industry sees electrical and electronic accessories to have the best potential, followed by audio-visual products, home appliances, electronic gaming products and digital imaging products. Industrial professionals also favour VR/AR devices for audio-visual and digital entertainment. For the houseware industry, most expect eco-friendly products, furniture, kitchenware and gadgets to have the highest growth potential this year. As for the gifts industry, most viewed advertising gifts and premium, figurines and decorations, tech gifts and fashion jewellery and accessories to be the most promising product categories. To encourage more people to launch start-ups in Hong Kong, the HKTDC introduced a Startup zone at the Electronic Fair (Spring Edition), ICT Expo, Houseware Fair and Gifts Fair for the first time to provide a low-barrier exhibition opportunity for start-ups under three years old. The zones were well-received, attracting more than 130 start-ups from Hong Kong, the mainland, India, Japan, the United States and Taiwan. Apart from meeting buyers from around the world, the start-ups were offered all-round services, including by taking part in pitching sessions and "Startup. Smart Launch", to promote their solutions or products to potential investors, buyers and the media. Local start-up Votee Ltd showcased its self-developed market research solution at the International ICT Expo. They found potential clients from Hong Kong, Malaysia and the US to apply its solutions to ICT, retail and other areas. The company also met potential investors from the mainland and the US and will formulate pitching proposals to find new funding and expand business. The HKTDC is committed to enhancing the support services provided at the fairs to generate more business opportunities for exhibitors and buyers. 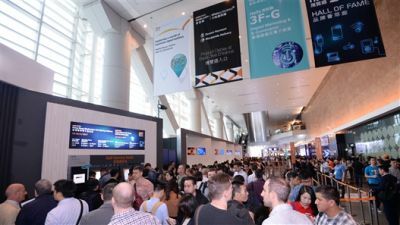 During the April fairs, the HKTDC helped connect buyers with exhibitors by arranging one-on-one business matching meetings based on buyers' needs. First-time Gifts Fair buyer Fan Blocks Inc, a Canadian e-commerce retailer focused on gift boxes, identified nearly 20 suppliers for different types of products through the fair's business-matching service. In addition, to cater to the O2O sourcing trend and the buyers' growing need to source in small orders, the HKTDC set up hktdc.com Small Orders zones at the Lighting Fair, Electronics Fair, Houseware Fair and Gifts Fair, featuring a total of nearly 1,200 showcases. By simply scanning a QR code, buyers could receive product information, place orders, settle payments and arrange shipment. During the April fairs, the zones generated more than 64,000 business connections, bridging buyers and suppliers and promoting further cooperation.